In 1996 I received an email from a friend named Ken Estes, asking if I knew a writer named Tananarive Due. Now, my memory can be punk at times, but I was fairly confident that if I'd ever heard a name like that, I'd remember it. Nope, confidence was high that we'd never encountered each other. He said she was a black writer he'd met at a convention, and that he thought I'd be interested. I looked her up, and saw what I considered to be a rather severe picture of an African-featured woman who I judged to be about six and a half feet tall, towering above Octavia Butler territory. Looked imposing. Ken had used language implying he thought I'd be attracted, but I didn't see it. In 1997, I was scheduled to appear at the "African American Fantastic Imagination" conference at Clark Atlanta university, along with Samuel Delaney, Octavia, Jewell Gomez and... Tananarive Due. I didn't really think about it more, as that initial picture had given an impression of Amazonian strength, but not softness. None of my antennae were tingling, so to speak. My first morning at the conference, I woke up, dressed, and headed downstairs to have breakfast. Someone came out of the room next to me, a cute, short girl (yes, I registered her as "girl" not "woman"—she seemed so young) with a tight 'fro and glasses, asking me if I was Steven Barnes and did I mind company for breakfast? I was glad of the company, and we went down to the coffee shop. She was chatty and fun, and I was charmed. Later in the conference, (she was now dressed for actual public consumption, and my, she cleaned up well!) she was personable, kind to the attendees, funny, and, in conflict with that original photo (which I call her `Voodoo Priestess' jacket shot) cuter than hell. But I admit that I didn't expect a lot from her writing. Any time you have a tiny community inside a larger one, the chances are that members of that community will celebrate ANYTHING that vaguely resembles talent. I remember a gay radio show in Los Angeles breathing a sigh of relief that a novel released by a lesbian writer was actually good—they didn't have to pretend enthusiasm. I felt much the same nervous anticipation of reading Tananarive's work. Was prepared to be polite and supportive, and very careful with my word choices. Sort of like telling the mother of an ugly baby that MY, that child has beautiful eyes! Well... at a bookstore signing, I got my hands on a copy of her first novel, The Between, and started reading. And was knocked out. This young woman (yep, I was starting to acknowledge her maturity. Just like that. Ain't it weird?) had a greater ability to convey real-world descriptions, with a more lucid and fluid prose style, than I had ever managed in my own memetic writing. I was stunned, and right then I realized that Tananarive had the potential to be great. My thought was to offer her any help I could, to treat her like a little sister and, without any strings at all, be one of her supporters and protectors. That neutral position lasted about 24 hours, until she gave her keynote speech, at which she described maneuvering to get a cover blurb from Steven King. It was brilliant, a combination of chutzpah, skill, timing, psychological insight, and luck. I remember thinking "Wow, she's REALLY smart." And at the same time, the exact same instant, I thought: "and she's REALLY cute, too..." and a chill went down my spine. And a light went on in my head. And I realized I was feeling something I had never felt, ever, for any human being. It was a revelation, the closest thing to love at first sight I'd ever experienced. I knew I was in trouble, and knew that I needed to know her better, to see if this alien feeling was something real. And whether it was mutual. We all flew home the next day, and by then Tananarive and I were thoroughly smitten with each other, sitting in the Atlanta airport holding hands and dreaming of building an empire together. A little less than two years later, we were married, and since that time we've written two scripts together, six books, raised a (step) daughter, adopted a son, lived in Washington, California and Georgia, and anchored ourselves firmly on the roller coaster of life. She is brilliant, lovely, passionate, athletic, a wonderful step-mother and mother, and absolutely the world-class writer I discovered within three minutes of opening her book. And she is, beyond any question, the love of my life. 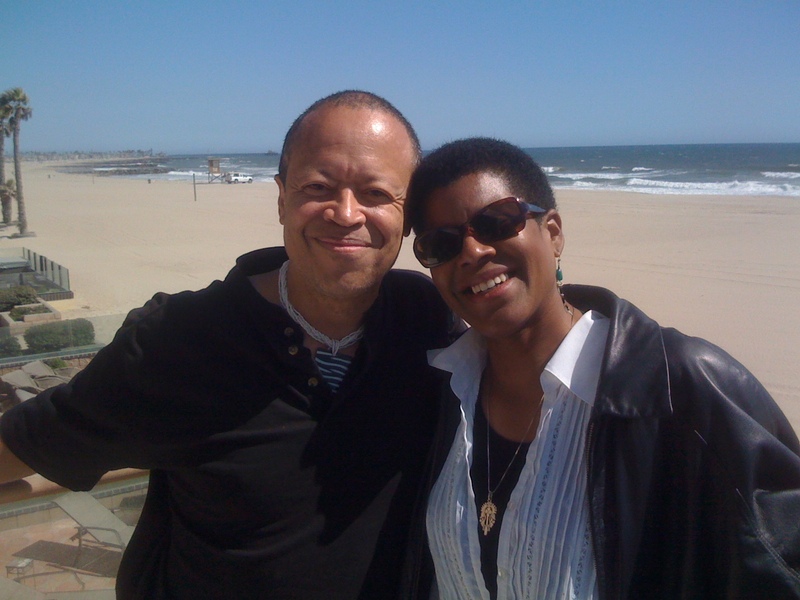 Ladies and gentlemen, it is my pleasure to present my wife, my writing partner, and my best friend, the one and only Tananarive Due. Originally published for Arisia in 2013.